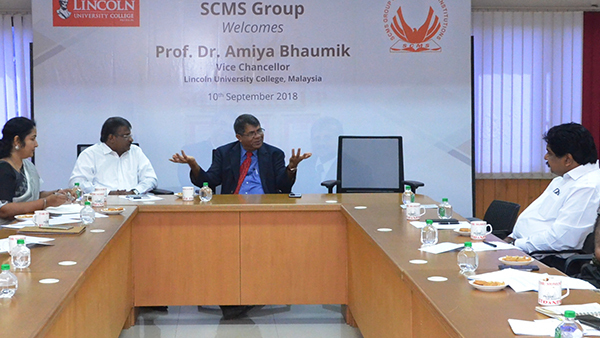 Kochi: Prof. Dr. Amiya Bhaumik, vice chancellor, Lincoln University College, Malaysia has visited SCMS campus for the expansion of the MoU which was inked earlier between this two institutions. As per the meeting, opportunities for PGDM students from SCMS to obtain additional MBA degree from Lincoln University College, Joint PhD programs, opportunities for students enrolling in Corporate PGDM programmes at SCMS to complete their final semester at Lincoln University College. The engineering, bio technology and research sectors of SCMS also will obtain benefit in addition to the agreement. The directors of various SCMS institutions participated along with Prof. Pramod P.thevannoor, Vice Chairman, SCMS Group. Photo: Prof. Dr. Amiya Bhaumik, vice chancellor, Lincoln University College, Malaysia addressing the SCMS team at SCMS main campus in kalamassery. Prof. Pramod. P.Thevannoor, Vice Chairman, SCMS Group also seen.